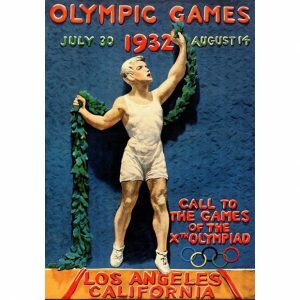 Today marks the 83rd anniversary of the 1932 Summer Olympics in Los Angeles. 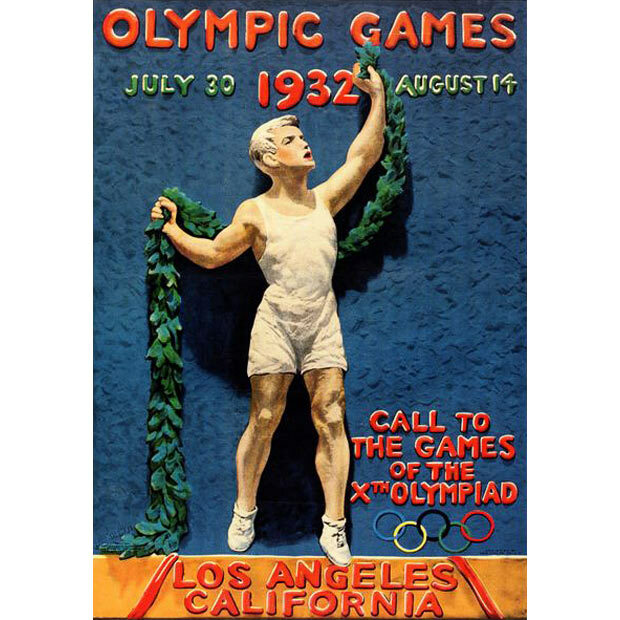 This X Olympiad was held during The Great Depression, and though the event was a resounding success with many historical moments, the weight of the depression could be felt throughout the games. This could be seen in the decrease in participation from the 1928 Summer Games in Amsterdam, where 37 countries and 2,883 athletes competed. In 1932, 37 countries and 1,332 athletes participated. The games were hosted at the Los Angeles Memorial Coliseum, briefly dubbed “Olympic Stadium” for this time period. This coliseum is still in use; in fact, it was recently used during the 2015 Special Olympics World Games in Los Angeles. The 1932 Olympics were the first time an Olympic Village was built and also the first time a victory podium was used. Babe Didrikson Zaharias also competed at the 1932 Summer Olympics, where she won two gold medals and one silver medal in Track and Field. The 1932 Summer Olympics were the second and final time the sport club swinging was an Olympic event. 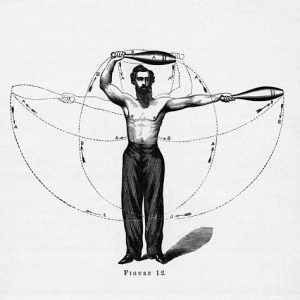 While the name “club swinging” may evoke visions of baseball players practicing their bat swings, the event itself was much more complicated than that. 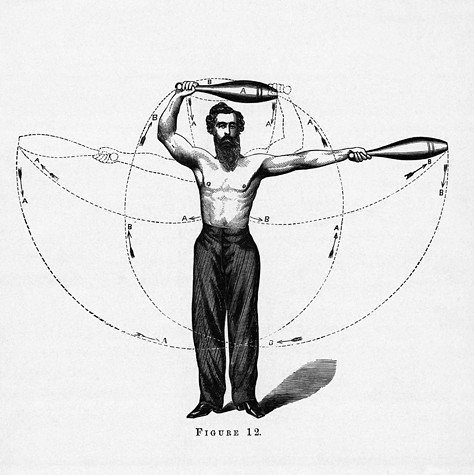 Athlete would hold two clubs, which were often decorated with ribbons, and move them about their bodies in a rhythmic fashion, careful to not hit themselves. George Roth won the gold medal for Olympic Club Swinging. American George Roth won the gold medal for this event in 1932, and his story is one that reminds us of the difficulties families were facing during The Great Depression. George Roth was an unemployed gymnast who, along with many other Americans, had fallen on hard times. 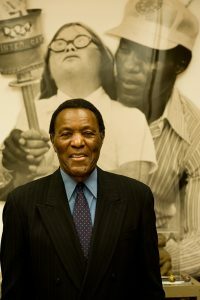 It was rumored that during the Olympics, he would take food from the Olympic Village to share with his family. After he was awarded his gold medal, in front of a packed audience, he hitchhiked his way back home. After the Olympics George worked for the WPA and later for Shell Oil. 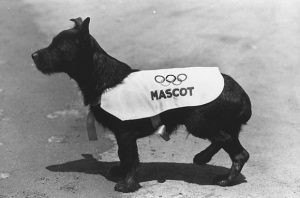 Mascots are an important and fun part of the Olympics, and it was during the 1932 Summer Olympics where this tradition began. The stories say that a Scottish Terrier wandered into the Olympic Village, and the athletes briefly adopted him for the duration of the games. Named “Smokey,” this dog was the unofficial, but very cute, living mascot for the games. Yesterday we announced our 2015 Spring Grant Recipients, which were recently selected at our June board meeting. Many of the 26 organizations chosen have received continued support from us over the years, but this round of grant recipients has a handful of new groups. 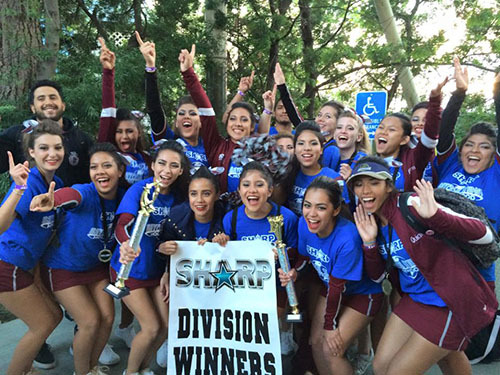 Among those is the varsity cheer squad at Sherman Oaks Center for Enriched Studies (S.O.C.E.S.). However, the grant we’ve awarded S.O.C.E.S. cheer is a bit different from our other grants because it is a matching grant. Cheerleading squads go hand in hand with high school sports. The cheerleaders are at every sporting event, lead the pep rallies, and many people would call them the backbone of school spirit. The S.O.C.E.S. varsity cheer squad boasts 21 dedicated high school students who work hard in the classroom, in the gym and competition, and on the sidelines at school sporting events. While the squad members are required to maintain a 2.5 GPA minimum, their average GPA is 3.0, with many of the students taking on a rigorous academic schedule with Advanced Placement classes. This team spans ethnic, socio-economic, gender, and religious boundaries to create a group of unique individuals, including a student who has autism. Beyond simply cheering for the school’s sports teams, the members of the S.O.C.E.S. cheer squad are breaking barriers and fostering relationships with other students with whom they may not otherwise interact. The squad has come together on several occasions to work hard and achieve their goals. Last year they practiced long hours each day – before and after school – to perfect their best routine, which helped them win 1st place in their division at a cheer competition. On top of their competitions, academic success, and dedication to supporting the school’s athlete teams, the S.O.C.E.S. cheer squad has also recently had to prioritize fundraising. After the Los Angeles Unified School District (LAUSD) reclassified cheerleading as a non-sport, the S.O.C.E.S. cheer squad lost their funding. Over the past two years, the squad has managed to get by with donations from families and the community, bake sales, and restaurant fundraisers. Now they have reached out to us for help, and we are pleased to offer them a matching grant in the amount of $10,000. We have been impressed with the dedication and hard work the members of the S.O.C.E.S. cheer squad have displayed. They are driven to succeed, and we are optimistic they will raise the rest of the funds. The grant and raised funds will go towards paying their coach’s salary, providing new cheer shoes at the beginning of the school year (a safety requirement), team-building and skill-sharpening at the United Cheerleading Association’s summer cheer camp, and another competition in November. If the team excels at November’s competition, they will advance to the National High School Cheerleading Championship in Orlando, Florida in February. We are confident this team will reach their goals! The team is already hard at work raising the matching funds for the grant. Their CrowdRise site allows individuals and businesses to make donations for this project, and so far they have raised $2,585! The booster club has also formed a fundraising committee, and different families will lead various fundraising events. As the S.O.C.E.S. cheer squad is hard at work raising money to make up for the lack of school funding, the state of California is in the process of passing legislation that would classify high school cheerleading a sport. If passed and signed by the governor later this summer, the bill would go into effect for the 2016-2017 school year. Regardless of whether or not the LAUSD decides to then fund cheer squads, which would be officially recognized as sports teams, for the 2015-2016 school year, the S.O.C.E.S. cheer squad is still relying on fundraising and our matching grant.